On March 11-13, 1988, about 200 women attended the YWCA Hispanic Women’s Leadership in Houston Texas, “Celebrating Excellence.” It had been ten years since the last of such conference. Soon after, twenty of those women, inspired by their experience organizing and attending the YWCA women’s conference, launched their own Hispanic Women’s Leadership Conference Committee with the goal of continuing the celebration as an annual forum to encourage and promote the development and advancement of their community. Beginning with its first independent conference the following February, Houston’s Hispanic Women’s Leadership Conference Committee, later rebranded as Hispanic Women in Leadership, quickly made a consequential and enduring impact to enable, power, and uplift the city’s Hispanic women. 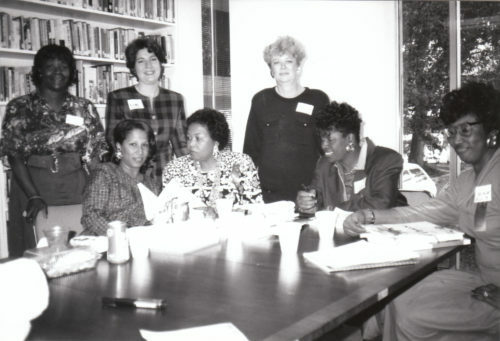 The Hispanic Women in Leadership Records archived at the University of Houston Libraries Special Collections document how within just the first decade of the organization’s activities, Hispanic Women in Leadership both embodied and demonstrated wide-ranging leadership for its community. As a true grassroots effort from its founding, the Steering Committee members of the Hispanic Women’s Leadership Conference Committee recognized in the invitation to their first gathering that, “Success can be achieved only if women such as yourself become active participants” in realizing the vision. 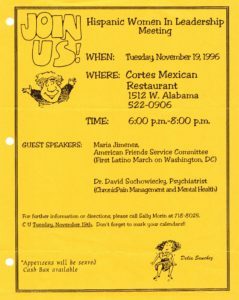 Less than a year later, with over one hundred $10-dues-paying members and even more women—and men—in attendance, HWLCC held their second annual conference, “The Hispanic Woman – Yesterday, Today and Tomorrow,” featuring noted keynote speakers psychiatrist Dr. Ninfa Cavazos and educator Dr. Guadalupe Quintanilla. The conference’s two keynote speakers exemplified what was to become the core purpose of the organization: to further the health and well-being while also promoting the education and advancement of Hispanic women everywhere. Today, the annual conference remains the primary activity of Hispanic Women in Leadership’s efforts. However, the organization’s deeper purpose, as can be discovered in its historical archives, has had a more acute and meaningful impact on its community. The conference itself was the vehicle for creating networks,- connecting community members with career-oriented Hispanic women role models, encouraging training and skills development, and promoting the appreciation for Hispanic culture and heritage. Diane Olmos Guzmán, one of the organization’s founding members, provides a brief history of the organization in the video above. She also describes some of the organization’s activities and contributions to the community. 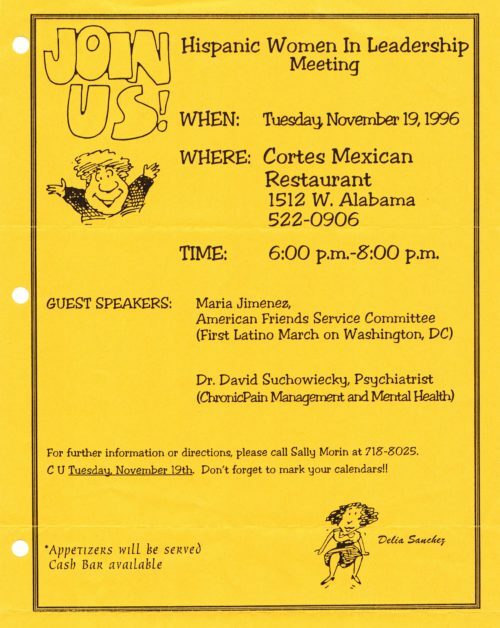 HWIL members used flyers, such as this one, to promote their events within the community. One of the most important events for this organization was the Hispanic Heritage Scholarship Style Show & Luncheon. During this event, HWIL raised funds for scholarships.